Introduction EMSL Analytical offers industrial hygiene testing services, sampling supplies, monitoring instruments and personal protective equipment to safeguard employees. Each year on April 28th, Workers’ Memorial Day is observed in the United States. It is also the same day that the Occupational Safety and Health Administration (OSHA) was established back in 1971. According to OSHA, Workers’ Memorial Day is a day to honor those workers who have died on the job, to acknowledge the grievous suffering experienced by families and communities, and to recommit ourselves to the fight for safe and healthful workplaces for all workers. Protecting the health and safety of workers is a critical function as more than 4,500 workers are killed on the job each year and another 3 million are injured. A crucial component of protecting employees involves industrial hygiene (IH) professionals who put their expertise to work to safeguard workers and prevent accidents. Supporting the industrial hygiene community and their efforts are the laboratory and product specialists at EMSL Analytical, Inc. 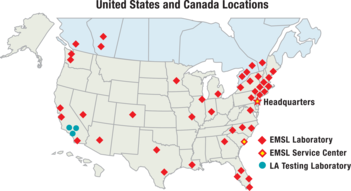 Since 1981, EMSL has offered laboratory testing and today has facilities located from coast-to-coast in the United States and Canada. EMSL provides a wide range of IH services along with all of the sampling supplies and equipment necessary. EMSL’s Product Division also has a comprehensive selection of IH monitoring instruments and personal protective equipment (PPE) available at a moment’s notice. EMSL also recently sponsored a video discussing OSHA’s Top 10 citations in 2016. The video can be seen at: https://www.youtube.com/watch?v=Wetehlkmi9o. To learn more about EMSL’s industrial hygiene services and products, please visit www.EMSL.com, call (800) 220-3675 or email info@EMSL.com.